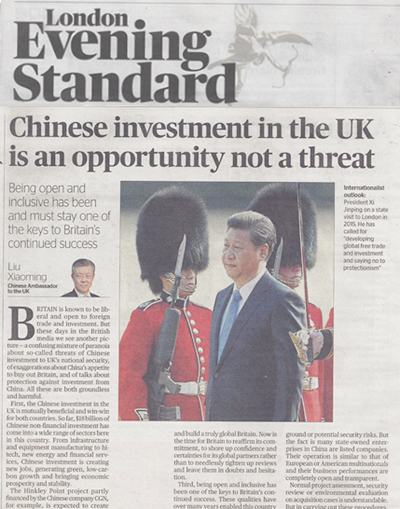 The Evening Standard Publishes a Signed Article by Ambassador Liu Xiaoming Entitled"Chinese investment in the UK is an opportunity not a threat"
Britain is known to be liberal and open to foreign trade and investment. But these days in the British media we see another picture – a confusing mixture of paranoia about so-called threats of Chinese investment to UK's national security, of exaggerations about China's appetite to buy out Britain, and of talks about protection against investment from China. All these are both groundless and harmful. First, the Chinese investment in the UK is mutually beneficial and win-win for both countries. So far, $18 billion of Chinese non-financial investment has come into a wide range of sectors here in this country. From infrastructure and equipment manufacturing to hi-tech, new energy and financial services, Chinese investment is creating new jobs, generating green, low carbon growth and bringing economic prosperity and stability. The Hinkley Point project partly financed by the Chinese company CGN, for example, is expected to create 26,000 jobs and, upon completion, reduce nine million tons of carbon emission every year. The £250 million auto plant in Coventry built by China's Geely Group will roll out a new generation of zero-emission cabs onto the streets of London by 2018. The ABP Royal Albert Dock project brings in £1.7 billion of Chinese investment. This urban complex of offices, homes and retail commerce will give London its third business and financial district and drive the development of east London. Other major Chinese investors, such as Huawei and Wanda, are increasing their investment here and, in doing so, casting a vote of confidence in UK's future. Second, the UK's unchanged commitment to staying open is key to boosting the confidence of foreign investors. Charles Dickens wrote: "It was the best of times, it was the worst of times". At this turning point for Britain, these words ring true. How the UK will choose between being more open and embracing the world, and lowering the portcullis and pulling up the drawbridge not only matters to Britain's own future but concerns its global partners. As the Brexit negotiations continue and the ensuing uncertainties and negative impacts unfold, for Britain and for foreign investors, confidence is more valuable than gold. After the Brexit Referendum, the British Government reiterated its commitment to free trade and its opposition to protectionism. The vow was to strengthen business ties outside the EU and build a truly global Britain". Now is the time for Britain to reaffirm its commitment, to shore up confidence and certainties for its global partners rather than to needlessly tighten up reviews and leave them in doubts and hesitation. Third, being open and inclusive has been one of the keys to Britain's continued success. These qualities have over many years enabled this country of 240,000sq km and 65 million people to remain globally visible and wield considerable influence in international politics, economy, science, technology and culture. One case in point is the City, the "square mile" that is not only the heart of London and the soul of the British economy but also a centre of global finance. This could not have been possible without the kind of openness to business and inclusive regulatory environment the City has long hold on to. The UK on its way to building a "Global Britain" needs to live up to such spirit and welcome international investors, as this is how Britain passes on its success story to future generations. Fourth, investment from China will not and can not pose a threat to the UK's national security. Chinese investment in Britain is made through fair and transparent procedures, and mainly focuses on civil and livelihood-related areas. In key infrastructure projects such as communication and nuclear plants, Chinese investors have been widely recognized to have strictly adhered to British laws and regulations in environment, health and security, and fulfilled their corporate social responsibility. The UK's inspection and monitoring system regarding foreign acquisitions, underpinned by the UK Company Law, the Financial Services and Markets Act 2000 and other laws, should be a source of confidence. People who know little about Chinese companies operating internationally often point at their state-owned background or potential security risks. But the fact is many state-owned enterprises in China are listed companies. Their operation is similar to that of European or American multinationals and their business performances are completely open and transparent. Normal project assessment, security review or environmental evaluation on acquisition cases is understandable. But in carrying out these procedures, Britain should make the right decision and maintain its confidence rather than being swayed by protectionism or looking at Chinese investment through Cold War-tinted spectacles. Chinese investors came here for cooperation and win-win results, and they look for a business friendly and welcoming environment. I hope they will find what they look for. I hope facts will show they have made a right decision by investing in the UK. At the World Economic Forum in Davos early this year, President Xi Jinping called for "developing global free trade and investment, promoting trade and investment liberalization and facilitation through opening-up and saying no to protectionism." China and Britain should join hands to advance economic globalization, to increase trade liberalization and to enhance investment facilitation so as to build an innovative, invigorated, interconnected and inclusive global economy. This year marks the 45th anniversary of ambassadorial diplomatic ties between China and Britain. It is also a year for consolidating the China-UK golden era. The two countries should treat each other as equals and with respect so that their cooperation on trade and investment could further deepen and bear more golden fruits and deliver more benefit to the Chinese and British people.